Yoga Nidra might be called 'yogic sleep' or 'dynamic sleep'. It is a state where you are conscious of your unconscious and subconscious called the 'hypnogogic state'. This state has a profound impact on all aspects of our Being due to this 'clearing' of the brain or mental states. For me, it helped me find the space between my mind, sensations and experiences. I universally recommend yoga nidra to everyone, but especially those post-trauma and with chronic pain issues. Because we all need to keep our minds clear no matter how great our lives are! What is the Hypnogogic State? This feels different to everyone. It is the state of falling asleep where your conscious, subconscious and unconscious all meet. 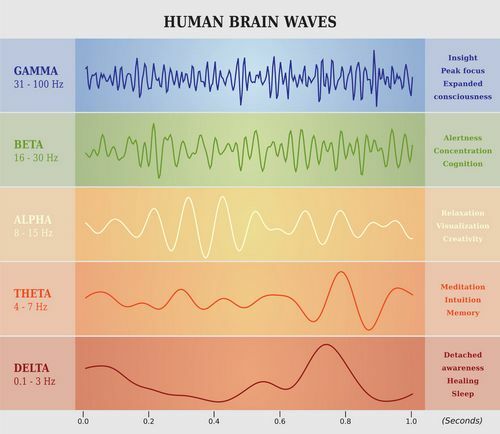 The practice takes the brain through all brainwave states, but the specific wave that we are interested in working within is the 'delta-theta state'. It is a deep healing state for the entire of your Being. Similar to hypnosis it accesses the subconscious and repressed memories that impact our daily decisions without our knowledge. However, it is not hypnosis and no-one will make suggestions to change your behaviour. You will just begin to notice more space between you and your life. The wonderful thing is that you can never do it wrong! It is the experience that you are supposed to have that supports where you are right now. BUT you set an intention at the start of your practice to remain aware of the voice that guides you throughout. The practice begins with the rotation of consciousness. This brings the Beta Waves (12-30 Hz) into a balanced rhythm. The Beta Waves are responsible for your conscious daily activity such as walking, talking, logic and reason. It is our relationship and interaction with the external world. This practice is important because it calms the conscious mind by focusing the attention. If you feel stressed, anxious or restlessness it is likely that your range is higher in the waves and you feel more agitated in your mood. This sounds like your inner critic and judge as the chatterbox thoughts of self-doubt. When we train this aspect of the mind through the rotation of consciousness, we reduce the brain waves to the lower rhythm and feel calmer. We are more clearly able to deal and handle life around us. As you step back you become calmer and less anxious. Helps to remove the judgmental mind so you can embrace unconditional love in your life. The breath-work follows and brings the brain waves to Alpha Waves (7-14 Hz). These are active during daydreaming, meditation, mindfulness practices and are induced through aerobic exercise. As you experience in daydreaming this state is one of entering your subconscious mind and what it wants or desires. This is your intuitive self that gut feeling which can guide your decisions in life. The breath helps to regulate the nervous system and bring your brain and body to a connected state. Breathwork in yoga helps us to become aware of emotional states that can be actively and consciously controlled by changing the breath. Through deepening the mind-body connection with breathwork it draws you into your inner awareness, or 'pratyahara' in yoga. When we calm the breath we can hear those signals from the body that guide our intuition. There are many variants on what practice happens at this point in yoga nidra, but all will draw the senses inward. Training the breath at this aspect of the subconscious alters the memories and connections stored beneath your reactions to daily experiences. At this point in the yoga nidra journey, you enjoy Theta waves (4-7 Hz). These are active in light sleep where REM occurs or in some deep Zen meditative states. Theta Waves create a sense of deep connection that can often feel spiritual. We mostly experience this state briefly between drifting off and deep sleep, as the subconscious unfolds to the unconscious. In yoga nidra, the mind is trained to work with the body for sensations and emotions that it can experience and control. The way of facing emotional states when in a deeply relaxed state is fabulous for building will-power. You uncover through the sensation work that in this state you create your conscious reality through your senses and how they are experienced. You discover that what sensations and emotions you feel are expressions of the mind, which you can step back from and change how you perceive your reality. That it is impossible to hold opposites together – they fall into nothing and everything. The opposites are what create our existence. You can choose to be less moody. At this stage, there are two approaches and you may experience both in one practice. This section of the practice is about archetypes, symbolism and deep associations that you connect to your conscious daily stories. You often are not aware of the stories you create in your experiences from past associations or loose connections in the mind that impact your life experience. This is the Delta Waves (0-4 Hz) and our deepest state of sleep where we are not dreaming. It can also be experienced in transcendental meditation. It is the state of universal consciousness and connection, where we receive information we cannot receive when conscious. This is the state of deep healing and has been proven to be the state that healers bring to another to create the healing effect. In this state, we can bring the collective healing to our experience through yoga nidra. In the practice, this can appear as random images rapidly fired at your brain. This is a quick-fire clearing of symbolic associations to allow the brain to sort. The second is a journey. Some approaches strongly follow the visualisation approach, but not all brains are highly visual. Therefore, it can work just as effectively in this section to work with feelings of an experience for some. The journey will take the student through a story that can be as trippy as the teacher deems appropriate. The idea is to break the boundaries of associations and connections, to clear the mind so that you have awakened consciousness. This practice is not to be taken lightly as the brain is in a very open state during yoga nidra. Your sankalpa is your personal resolve or intention from your deepest heartfelt desire. You repeat it to yourself at the beginning and end of the practice to place it within all aspects of your being, so it becomes true in your life. How to set your sankalpa or intention has been explained in this blog post. A simple practice that just requires that you rest for 20-30 minutes a day. How can it be so beneficial? Many benefits have already been stated throughout this blog post, but there are more general benefits too. Yoga nidra can contribute to bringing about the Gamma Waves. Little is known about them, but they occur when we have bursts of insight and high-level information processing where there is a higher state of consciousness perception. The different breath patterns, oppositions and visualisation work have very different effects at all levels of your Being (the koshas in yoga). Apply a disciplined mind as you listen to the voice, this trains the thinking mind from rampant thoughts. You discover the space between your thoughts and experience. You are more rested because 20 minutes of yoga nidra is the equivalent to 2 hours sleep. Covers all your types of meditation practices and their benefits for the brain in one practice - efficient! We have a selection that you can try or if you are working towards a specific purpose or with an issue in your life, it is helpful to work with a bespoke practice tailored for you. Contact us for a free consultation to see about having one recorded for you!